Sponsor a Child at The LaCroix New Testament Mission in Haiti and transform a life! Every child counts! Every child matters! A quality education in a Christian environment is provided so that opportunities may be opened to them to get a job, to better their standard of living, and to assist the needs of their family. Not only have the children been touched, but also hundreds of families have turned from voodoo to a commitment of Christ through the love expressed to them and to their children. Pastor Pierre contends, “A hungry stomach has no ears.” Therefore, a meal is provided daily to the students of the schools. A medical clinic serves the schools as well as the people of Haiti in general. For just $20.00 a month, your gift will provide a quality education in a Christian environment, a nutritious meal, a school uniform and hope for the future in an otherwise hopeless situation. You can give monthly ($20), quarterly ($60) semi annually ($120) or annually ($240). If you make a pledge to sponsor a child, we ask you to be as faithful as possible in your support to care for their ongoing needs. 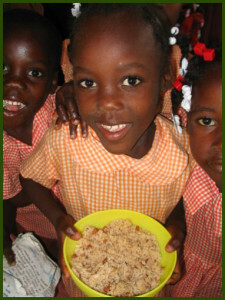 From time to time, you may send your child and their family a gift of rice and beans, animals, or trees. You can designate the purchase of this special gift for your child, payable the same as your sponsorship – noting it is for your child. Order forms will be provided with your sponsorship packet, which will also contain a picture and profile of your Sponsored Child.